DFB Exclusive! 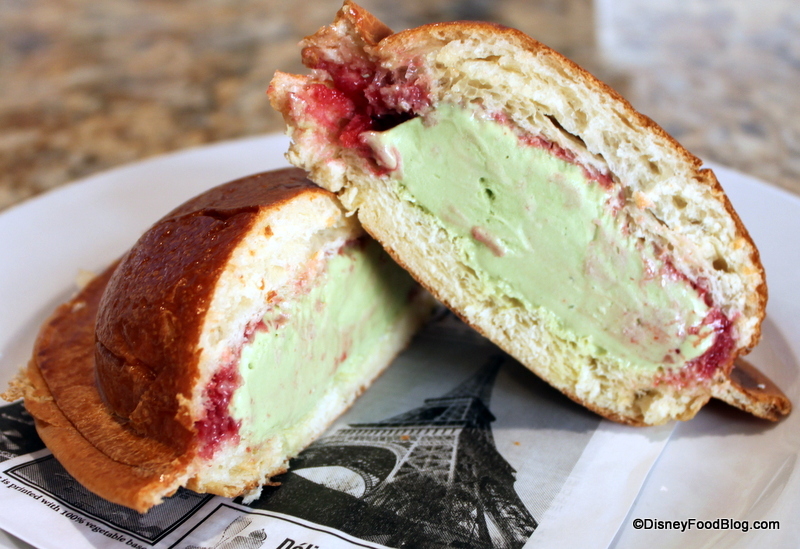 New Pressed Brioche Ice Cream Sandwich at Epcot’s L’Artisan des Glaces! I’m so excited to share with you a DFB EXCLUSIVE news item! 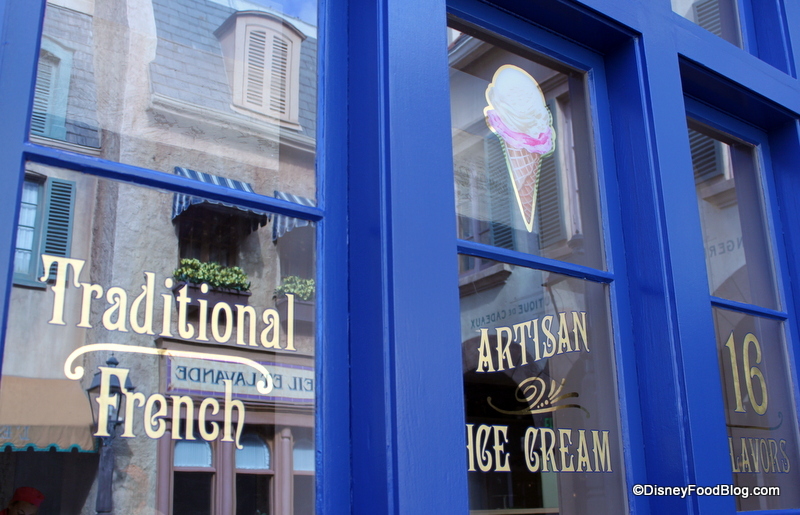 This week, you lucky Epcot-goers are going to be able to try a brand new treat in the France Pavilion! 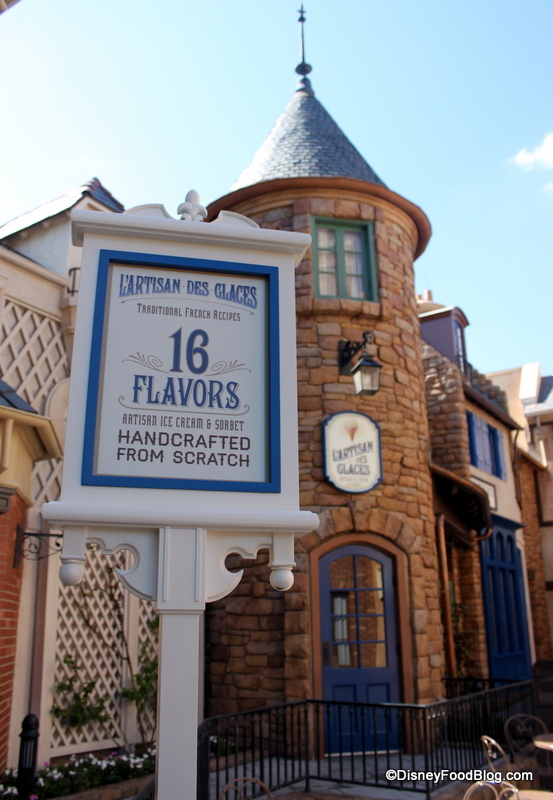 You guys remember when we showcased the brand new L’Artisan des Glaces earlier this Summer, right? 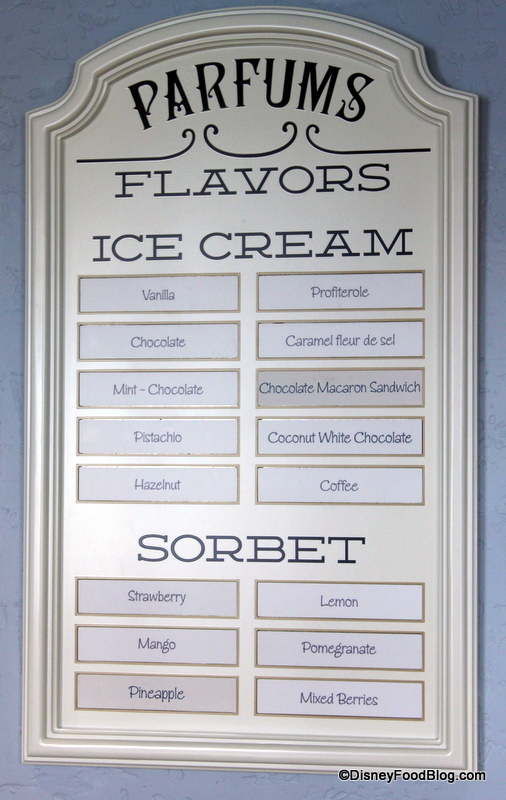 The newly renovated space now offers a selection of 16 different house-made sorbets and ice creams (For realz!! I saw the ice cream machines!!) 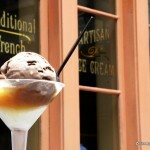 as well as the now-famous Ice Cream Martini! 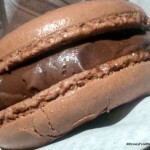 And don’t forget the chocolate macaron ice cream sandwich — heavenly! Anyway, we’ve got something brand new to tell you about today!! Something BIG!!! 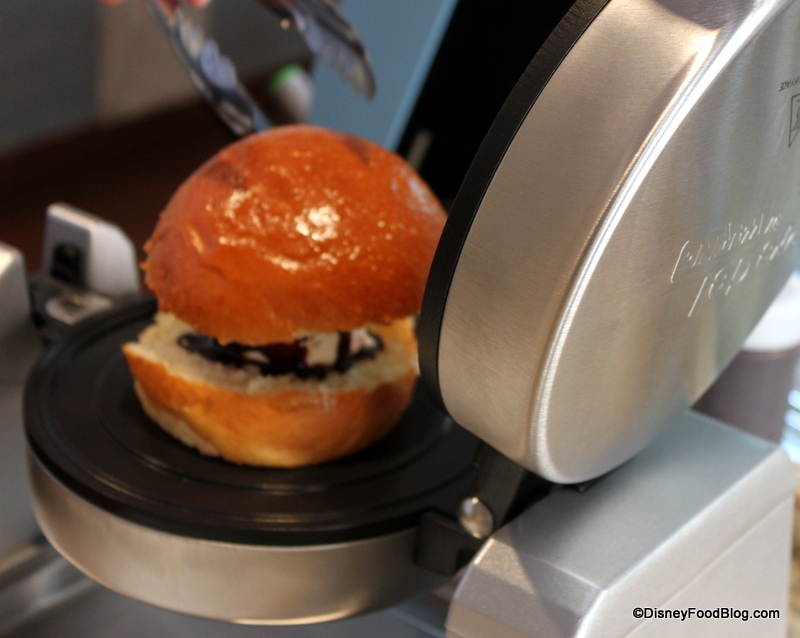 Introducing the Croque Glaces — Pressed Brioche Ice Cream Sandwich! 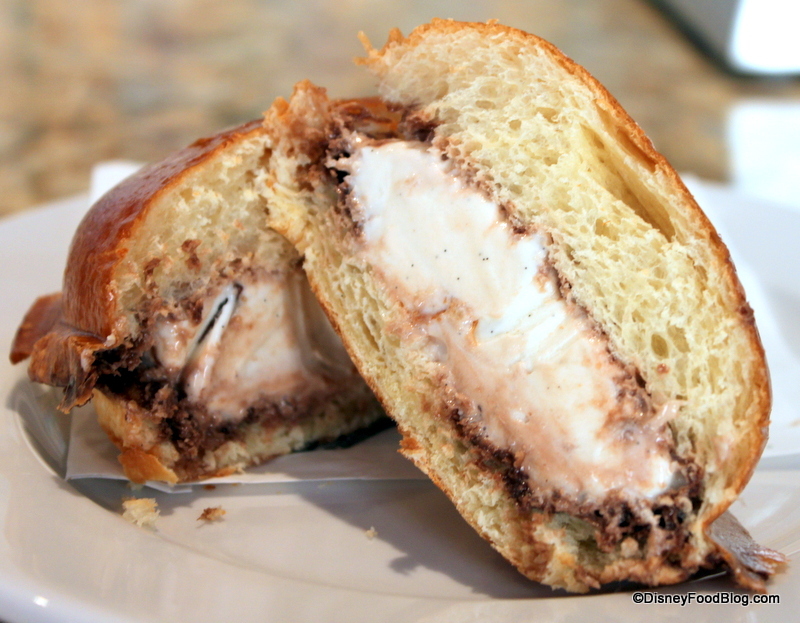 The Croque Glaces — or Brioche Pressed Ice Cream Sandwich — is a warm-cold-crispy-chewy, sweet sandwich of wonderfulness that’s coming to you VERY soon at L’Artisan des Glaces. Maybe even TODAY! 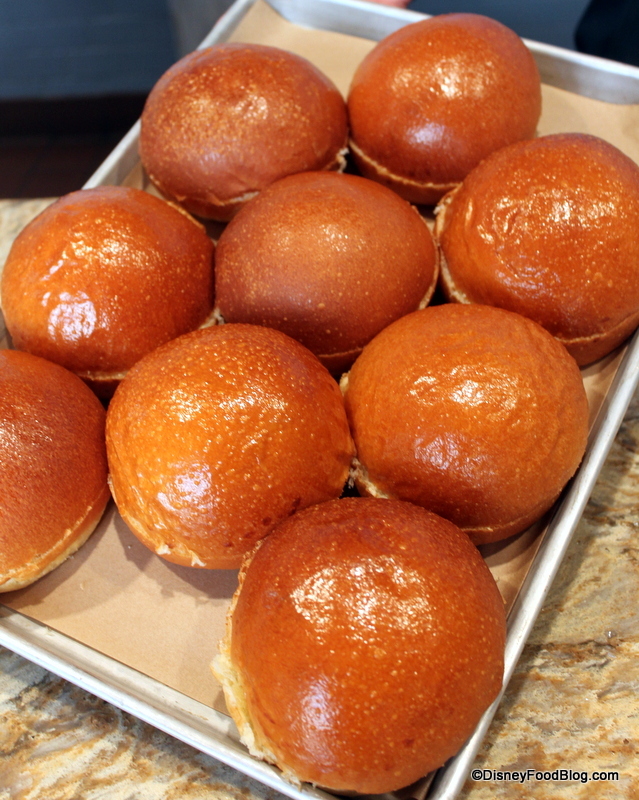 This new treat starts with freshly made (like…today) brioche, created next door at Les Halles boulangerie. These mounds of golden perfection (seriously…I ate some…they’re amazing) are cut in half, and then you get to customize! 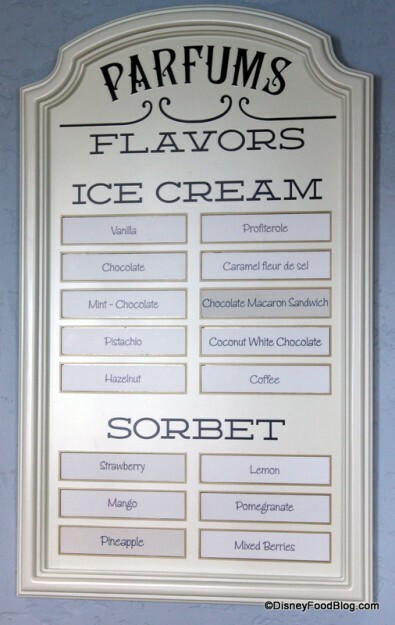 Choose which of those 16 house made flavors suits your fancy, and which sauce to pair it with! …then douse it with some serious sauce! Choose from chocolate or raspberry! It comes out of the press with edges sealed — no muss no fuss. Pretty impressive. But inside that fluffy package is still-frozen ice cream, soft enough to allow a big ol’ bite. The sauce melts easily into the surrounding, warm and crispy brioche; and you have just enough ice cream meltage to give the inside of the brioche an entirely different texture than the now-crispy outside. Finished Pressed Brioche Ice Cream Sandwich -- Croque Glaces! Add a little color to your choices with pistachio and raspberry! 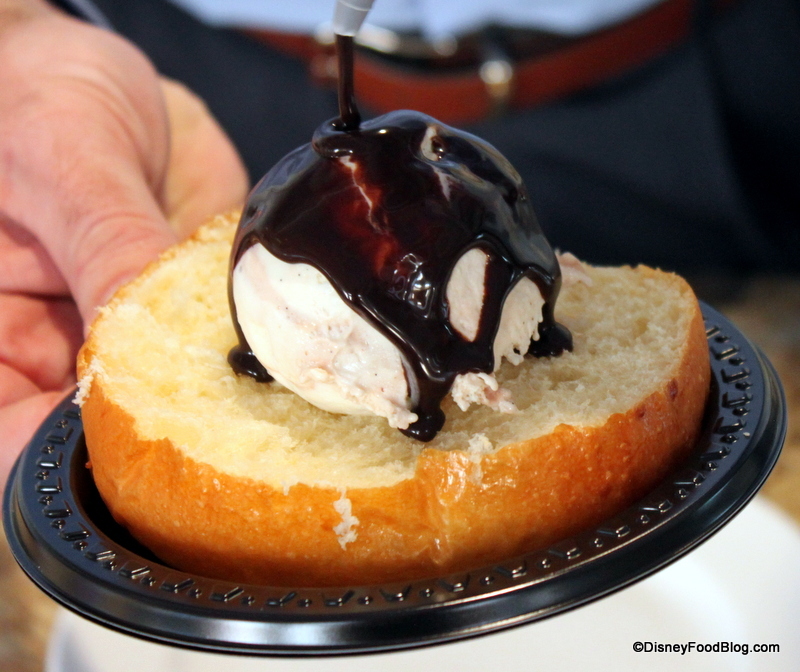 But my favorite combo was the Salted Caramel ice cream + chocolate sauce. There’s nothing better than a sweet-meets-salty, cold-meets-warm dessert like that. A perfect match! 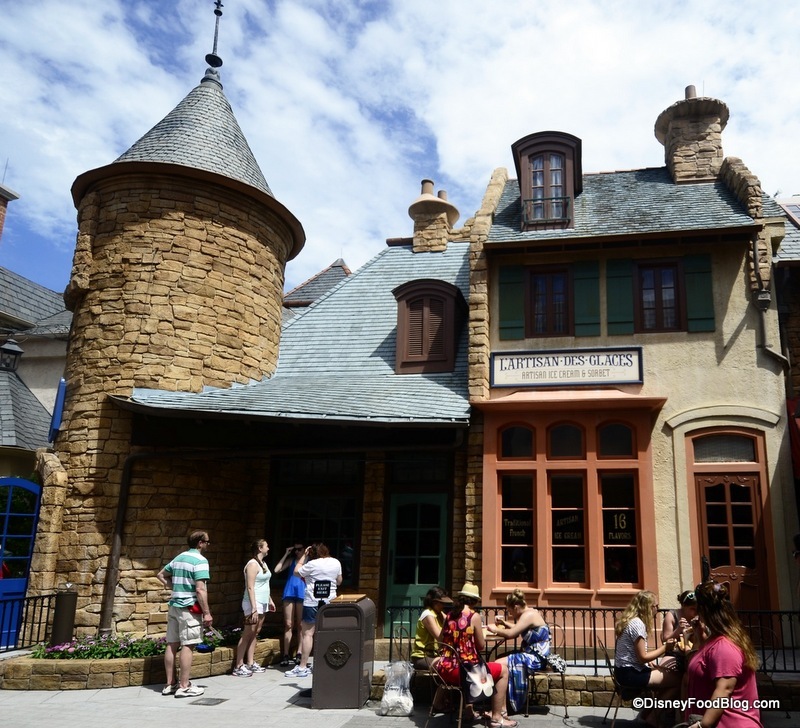 The Croque Glaces will cost you $6.10 — the same as a double scoop of any flavor in a cone — so the price point is actually very reasonable. Especially since this thing is easily big enough to share. I was so excited to get the chance to try this before it’s even on the menu! As usual here at the France pavilion, they’re shaking it up with new ideas and specialty items available nowhere else in Disney World — or any Disney park that I know of for that matter. 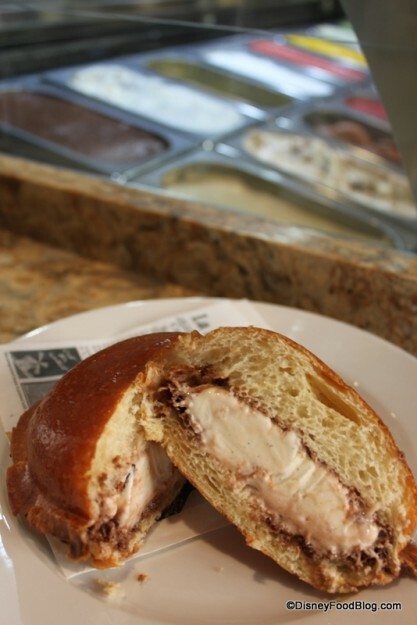 What flavor combo will you choose for your first Brioche Ice Cream Sandwich? Let us know in the comments below! First Look! L’Artisan des Glaces Sorbet and Ice Cream Shop in Epcot’s France is Open! See Full Menu and Photos Here! Hazelnut with chocolate is a given. Oh wow, I have to try one of these on our next trip! Yum! 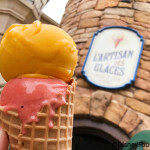 I am so bummed I won’t be visiting epcot for the rest of this trip, but have to add this to next years! 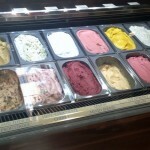 The flavors all looked so delicious. I don’t usually care for sweets, but, hey, it’s a sandwich, so I’ll give it a try. Can we use this for snack credit with our DDP? Sip on a mimosa and wait? I love the way you think. 🙂 These look fabulous. Thanks! Literally on the bus to Ft Wilderness from EPCOT when I saw this. Bad timing! Guess it will have to wait until tomorrow. Definitely the Caramel ice cream with the chocolate syrup for me. I’m just not sure about the roll; is there a sweetness to this roll? I tried one yesterday and it was only ok. The brioche doesn’t have enough texture so you get too much of that untoasted wonderbread feeling. I think croissant dough or puff pastry would have worked better for my tastes; I’ll stick with the cones. I will say that the scoop sizes here are enormous, not at all like our experiences in Paris. Tried this the other die and loved it. 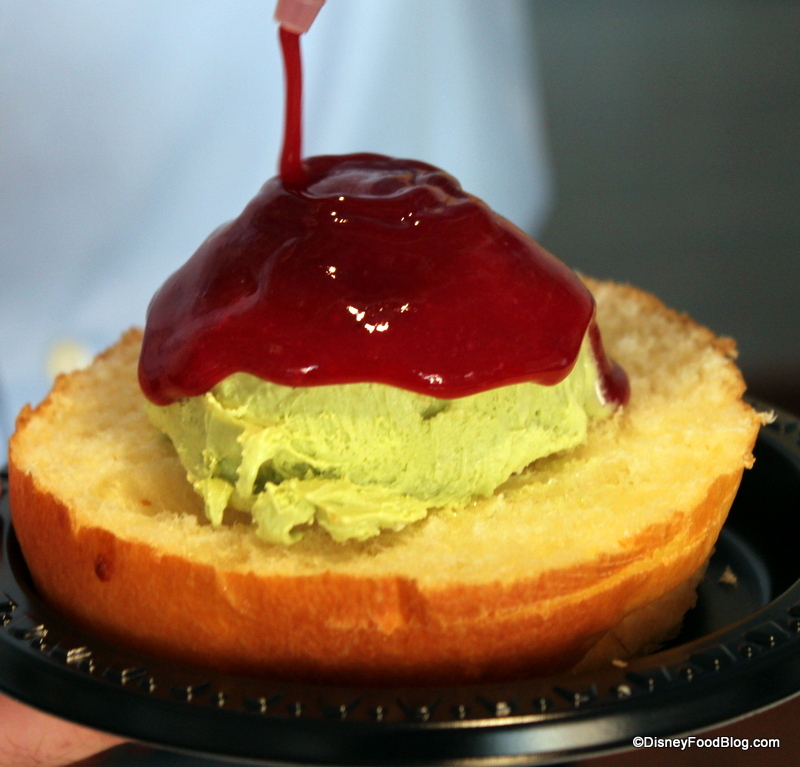 New favorite snack at Epcot. I don’t think that sounds too appetizing to me. Don’t get me wrong, I love ice cream, this just doesn’t look like my kind of treat. I have a new must-do for our trip this coming week! My mouth doesn’t usually water at pictures, but wow wow wow. Between the pics and description, this may be my first stop on our trip!! Thanks so much for sharing! Can I use a snack credit to get this? I’m dying here. I mean dying to get my mitts on one or more of these! This is a “must” for my December trip. 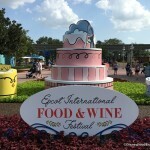 Here’s hoping they are still available come December and not just for the F&W. I tried this last week. I’m glad I tried it as it was an interesting texture profile. But I have no desire to have another one. Too me it was just too much bread that didn’t add any flavor. I was first in line one morning. Got the Hazelnut with Chocolate sauce. It was awesome! This is not to be missed. This was the best…. 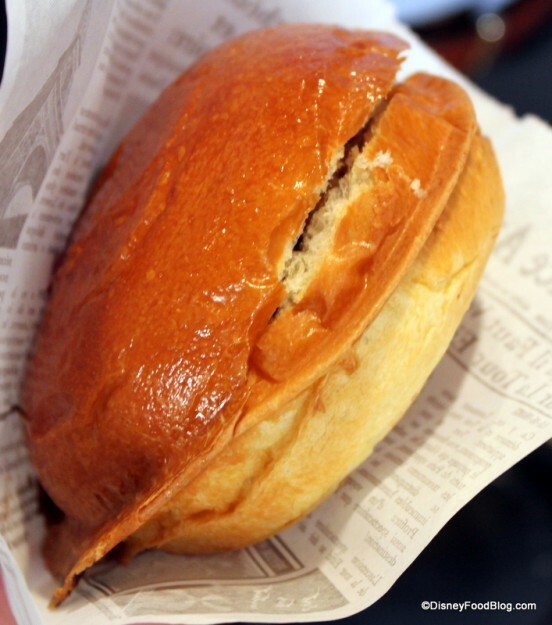 Melt in your mouth…. 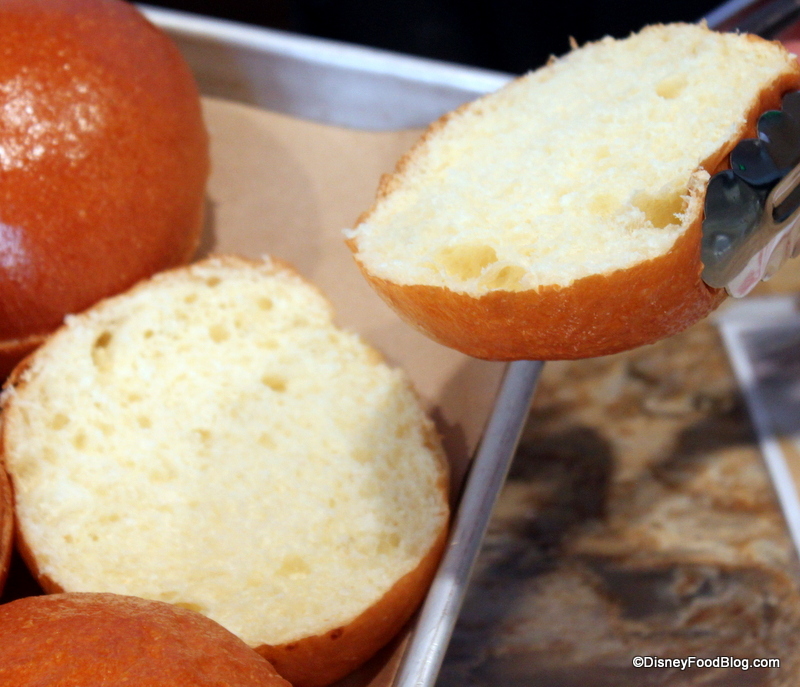 Two of them… One was salted caramel with chocolate and the other was coconut white chocolate with chocolate … Wish I could get my hands on a grill… Disney should sell the grills!!!!! AMAZING!!!!!!!!!!! SO EXCITED TO GO BACK FOR MORE! TRIED PISTACIO ICECREAM WITH CHOCOLATE DRIZZLE! MMMMMMMMMMM YUMMY! THANK YOU DISNEY! THIS IS A KEEPER FOR SURE!!!! 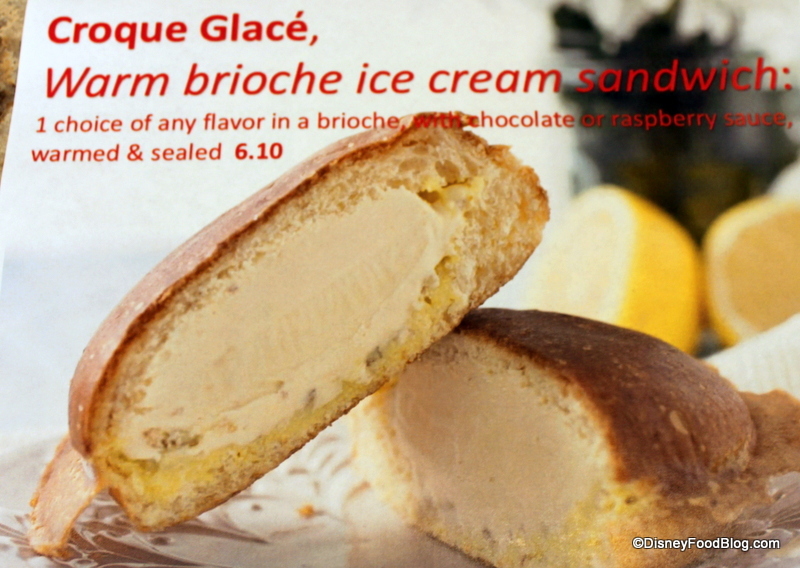 I wasn’t sure what to think back when I read this review – I was quite skeptical that ice cream on bread would be a good idea. Luckily, I was wrong – these things are great! I tried the salted caramel with chocolate sauce and was really excited for it but was highly disappointed!! 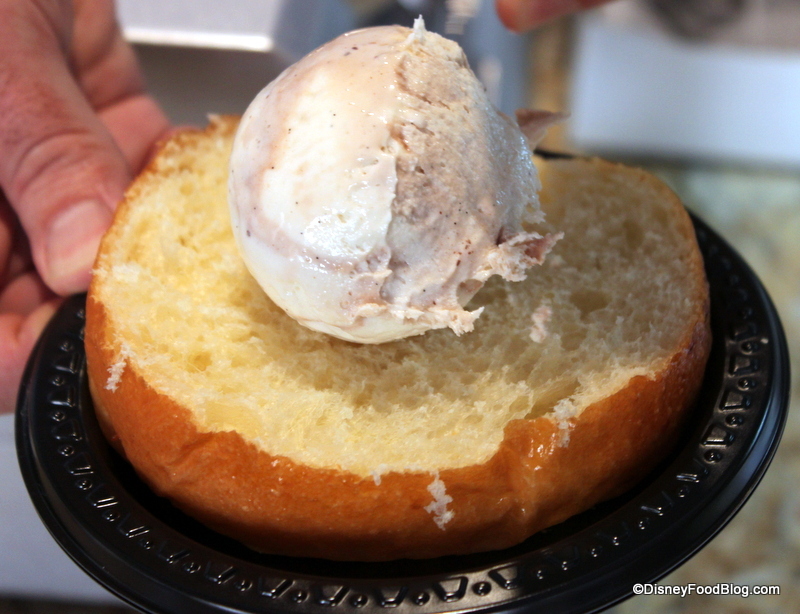 Bread and ice cream just don’t go together. I would have loved it with cheese and maybe some type of meat. Will it go as a snack credit (Dining Plan)?